What are we doing to control carbon emissions? Is becoming carbon neutral practical? There is much talk these days amongst environmentalists and other concerned people about reducing our reliance on carbon emitting industries and technologies. Is it possible to reduce our carbon emissions to zero? And if so, how could we do it? This article attempts to give some pointers on these difficult questions. If you are at all interested in green living and the environment you will already be aware that our energy needs are causing climate change. Many of the ways that we make and use energy cause carbon dioxide to be released into the atmosphere. There it acts as a greenhouse gas, trapping more of the sun's warmth. This results in global warming and climate change. Every time we get in our cars, or fire up the central heating system we are each contributing to the problem. So, to become carbon neutral would be a great benefit. To be carbon neutral just means that you do not contribute any extra (net) carbon to the atmosphere through your activities. Carbon neutral - what does it mean? To be carbon neutral means that for every quantity of carbon which you are responsible for producing you also lock up an equivalent amount - in a "carbon sink". In other words, your net carbon emissions are zero. Carbon is recycled and used in the natural world. The trick is to absorb and use as much carbon as you produce. There are a number of ways to become carbon neutral. So really - what is a carbon sink? A carbon sink is a natural resource which is capable of storing carbon and keeping it out of the atmosphere. Coal deposits from the carboniferous period are just that - naturally occurring carbon sinks. Oceans and forests and other large masses of plant life absorb carbon. These act as temporary carbon sinks. Coal and oil deposits are more long-term stores of carbon laid down over millennia. To work as a carbon sink for the purposes of reducing the amount of carbon finding its way into the atmosphere, a carbon sink needs to be capable of being enlarged. Clearly, we cannot enlarge the oceans but we can plant more trees. Even better would be a change whereby we just stopped cutting down trees without replacing them. There are on-going logging projects in places as widespread as Tasmania and Indonesia. In Tasmania virgin forest is being cut down - mainly for toilet paper and other very short-term uses. In Indonesia virgin rainforest is being replaced by palm oil plantations and other energy-intensive crops - some for grown for biofuels. It has been estimated that forest destruction accounts for around 25 - 30% of current carbon emissions worldwide. When trees are cut down they release their stored carbon back into the atmosphere. The actual processes of logging are often energy-hungry, too, causing yet more emissions. There are also ways being developed of storing carbon in the ground but many environmentalists are sceptical as to how effective they might be. There are many experimental schemes being tried, from artificial cloud cover to geological storage. The first coal-fired power station with carbon capture facilities has just gone on stream in Germany - Spremberg, September 2008. The technology is expensive and is not regarded as a complete solution to the problem of carbon emissions from coal. The ocean has become an unofficial carbon sink; coral reefs are dying because excessive carbon dioxide absorption makes seawater become more acid than it should be. The die-off of plants and other living things caused by acidification then causes yet more carbon-dioxide and greenhouse gas emissions. To understand how a carbon sink might work, lets review a few facts about the carbon cycle. Plants lock up carbon as they grow. When they die, or are consumed, the carbon is released back into the atmosphere. You may remember from class the carbon cycle: trees and other plants take in carbon dioxide (CO2) during the day and exchange it within their systems. They also emit oxygen - all of which is very good for other living things. No animal life could exist on earth without this cycle. It has been going on since the first primitive organisms evolved billions of years ago. Animals are part of the cycle too. They breathe in oxygen and breathe out carbon dioxide. Animal wastes such as manure also emit carbon dioxide as they decompose. This carbon cycle goes on in a grand way across the planet. The crucial thing is that it affects our weather systems. The carbon cycle and the weather systems linked to it are now being disrupted in a major way by our industrial activities - the burning of fossil fuels, (coal, oil, and natural gas) especially. Fossil fuels contain huge amounts of carbon and when they are burned CO2 is released into the atmosphere. This is carbon which has been locked up in the ground for millennia. The amount of carbon being released has increased dramatically in the last 200 years since the industrial revolution - and it continues to rise and rise. The net result is global warming and climate change. It is now agreed by the vast majority of climate scientists that climate change is being caused at least in part by human activities, especially the huge releases of carbon dioxide and other greenhouse gases. Becoming carbon neutral: Any solutions? One idea for becoming carbon neutral is that for every amount of carbon that you are responsible for releasing into the atmosphere, an equivalent amount can be locked away by planting trees. This idea has been given some celebrity highlighting by Chris Martin of Coldplay, who decided to neutralise the carbon from his one of his band's tours by planting trees. Coldplay planted a forest in Scotland to settle their carbon bill and thereby saved over 16,000 tons of carbon from being released into the atmosphere. They have also worked hard to communicate the climate change and carbon neutral messages to their fans. 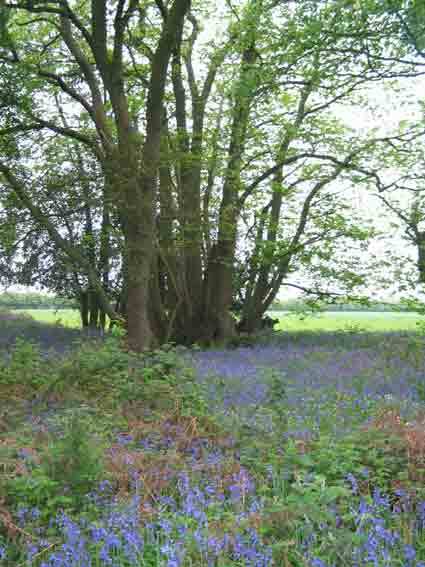 Picture above: trees in an ancient woodland. Planting trees to absorb carbon is worthwhile but not without problems. So... we should all plant forests? We can all contribute too. You might not be up for planting a whole forest but you could plant more trees to help offset your own carbon footprint. The more you do this the more you will head towards being carbon neutral. There are now organisations dedicated to making this a practical solution for anyone who is interested. You buy trees from them which they plant to offset your carbon emissions from your travel or other activities. Organisations such as CarbonNeutral in the UK will calculate your carbon emissions from, say an air flight. They then sell you the right number of trees to offset your emissions as a traveller, which they will then have planted on your behalf. A long haul flight half way around the world would cost about 5 trees. You can also off-set your carbon from more everyday activities such as driving to the shops or running your central heating or air conditioning. There have been criticisms of some of these carbon off-setting schemes. In some, trees have been planted which were then inadequately looked after. Also, trees are sometimes calculated as full-grown in the off-setting calculations. This is misleading because what you are paying for is young saplings which may or may not grow to become large trees in thirty years or more. So, once more it's a case of "caveat emptor" - buyer beware. If you are thinking of buying into one of these schemes it is worth doing some checks to make sure that the company is doing things properly. It is also worth remembering that these schemes only help to undo damage caused by greenhouse gas emissions. There is an easy tendency for people and organisations to believe that we can all carry on with "business as usual" because of schemes such as these. In truth, if we are to solve the issue of climate change in our lifetimes, far more drastic cuts in emissions are needed. Off-setting current emission is just not going to be enough. Most people are just not able to become carbon neutral this way. Family finances often do not support buying lots of trees; many people are just unwilling to spend their money this way. Despite the many initiatives of the last few years, our global carbon emissions continue to shoot up. You need to research the credibility of organisations offering tree planting as a way of offsetting carbon emissions. Unfortunately, there have been several instances of fraudulent schemes operating, where trees are not planted or local people are exploited. There are issues connected with stewardship; a planted tree may fail to thrive. Excessive claims have also been made for some such schemes. Both the UK and Australian governments have taken steps to approve or endorse schemes in order to ensure standards. Will planting some trees solve the problem? No but it certainly might help some. The amount of carbon emitted by each one of us in the developed world at the moment, on average, is about 11 metric tons per year. In the developing world the figures are less stark: nearly 2 tons per person. However, the amount recommended by environmental bodies as (possibly) being sustainable, is only 2 tons per person per year - and the figures for the developing world are rising steeply. China has already overtaken the United States as the top emitter of CO2 according to the Netherlands Environmental Assessment Agency in 2008. The increases in coal fired industries and cement production in China may account for two thirds of the world's increased carbon emissions. Nevertheless, their carbon emissions per head are still far lower than those of the west. China currently is responsible for about 3.5 billion tons - nearly as much as the whole European Union - while the USA has nearly one quarter of the world's emissions of carbon dioxide - a whopping 6 billion tons. World wide, these figures add up to some 24 billion metric tons of CO2 from the burning of fossil fuels (figure for the year 2000). So, there's a bit of work to do! The estimated amount of carbon now being emitted world-wide stands at over 35 billion tons, so things are getting worse, not better (2012 figures). Clearly, planting a few forests is not going to solve the whole problem! What else can be done to stop the effects of carbon emissions? The other obvious way that this problem can be tackled is for us to find ways in which the amount of carbon released into the atmosphere can be substantially cut. If we could return to a situation where we were only releasing, say two tons per person worldwide, it might be realistic to then deal with capturing that amount by planting trees every year. The problem is partly one for governments and industry to solve. Cutting emissions is generally not popular with industry as it is costly and runs counter to the prevail economic model of continual growth. Technologies for reducing emissions are becoming more numerous but are not always used for a whole variety of reasons. But is it possible to get such a huge reduction in our carbon emissions? Here in Britain we are currently using more than eight tons per person per year. So for us it would be a huge reduction. For US readers, the current figure is around 17 tons. Both countries have succeeded in reducing the per person figure in the last few years. With rising living standards and rising expectations, many, many countries have rising per capita carbon emissions. For example, the per head emissions for China are almost four times what they were a couple of decades ago. China is extreme because it has experienced such strong economic growth and it is still heavily reliant on coal and other fossil fuels. Many other developing nations are increasing their emissions sharply while developed nations struggle to make even a small reduction, thanks to better technology and some initiatives to discourage the worst practices. However, the real question for this site is how do we as individuals get to reduce our carbon emissions? We cannot control a lot of what industry does; lobbying the government to change legislation and to stop the more damaging industrial practices takes time and commitment beyond what most of us can supply. But we can change some elements of our own lives. And we can shop conscientiously and choose products with the health of the environment in mind. Here's a very brief look at what cutting our emissions down to around a sixth of current levels might entail - for individuals and families. How could we realistically cut back? What would cutting our carbon emissions mean? We would need to travel less but use public transport and bicycles a lot more. We would need to consider car clubs and shared electric and hybrid vehicles for personal travel. We would need to re-localise a good many of our lives. (See the work of Transition Towns for more on this.) We would need to shop locally for locally produced goods and use local services for most of our needs. We would need to import far fewer goods. We would need to use far less fossil fuel in our homes and in industry. The energy we use would need to be far more efficiently used. Local micro-generation of electricity would have to become the norm. Renewables such as solar would need to be employed wherever possible. We would need to recycle and re-use products far more. More recycling would need to be local. No more sending plastics half way around the world to be recycled! We would need to recycle waste effectively to minimise emissions.We would need to use far more sustainable biofuels and renewable energy sources for our power needs. We would have to cut out using petrochemicals in the free and easy way that we do at the moment - no more plastic milk bottles and throw-away grocery bags! We would almost certainly need to return to a more sustainable and traditional style of agriculture as modern agriculture relies heavily on fossil fuels for almost everything, including fertility. If you are interested in initiatives to re-localise our lifestyles, check out Transition Towns. As things stand, our global carbon emissions are going up year on year not down. Even the recent economic troubles have only slowed the increase slightly. And almost every politician of every hue is calling for more economic growth! Scientists now agree that the world needs to reduce carbon emissions by around 60% or more within the next 3 to 4 decades. This in order just to stabilise global warming at safe levels. The Kyoto Protocol has developed policies to help the world reduce carbon emissions. The more recent summits have failed to deliver lasting and credible emissions reductions. At least we can play a small part by cutting our own domestic carbon emissions. It's a small drop in a very large ocean!